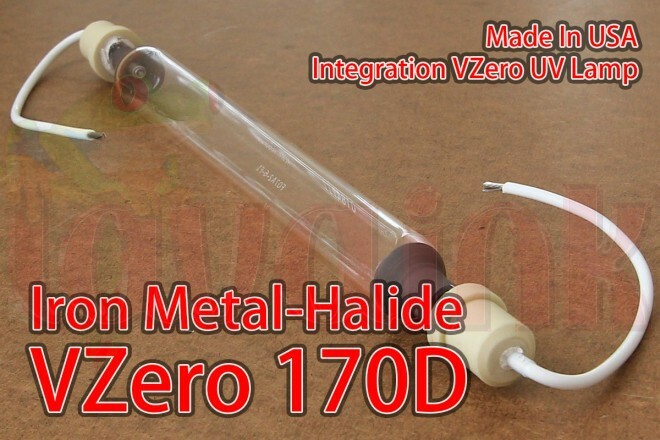 This UV curing lamp is Integration UV Lamp VZero 170D. UV Curing Lamp Bulb digital inkjet printers and that is 100% compatible replacement. More UV lamp at www.PolarLamp.com . maintenance. As the leading supplier of UV systems to the Digital Inkjet industry Integration Technology is able to offer clients advice and experience within the UV curing industry concerning the integration of hardware and the process of UV curing. • High intensity reflector system. • Rapid Warm up and Cool down. • High Flex cable up to 15m. • Comprehensive warranty backed by global support direct from Integration Technology and through its Strategic Partner IST Metz SubZero Shuttered Standard Features. • Double quartz filter system with replaceable front quartz. • One Year Integration Technology Warranty. • Long service life >30 million cycles. • Comprehensive warranty backed by global support direct from Integration Technology and through its Strategic Partner IST Metz.